We had a great day on the Artemis today. 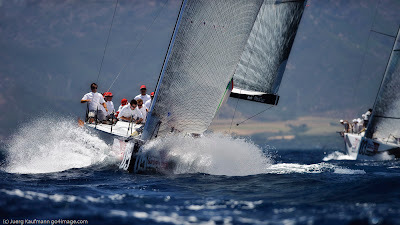 It was the Coastal Race today, a 30 mile course around the Gulf of Cagliari and we managed to take the checkered flag. 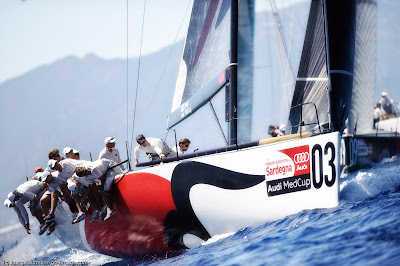 Team New Zealand finished second and Matador 5th after leading around the first windward leeward. We are now second to TNZ by 3.5 points. The Coastal Races have a 1.5 factor on the finishing position. After not a great start, we found a clear lane to the left which we thought may be the favored side. However, we decided to come back to the right a bit before Team New Zealand and Quantum who were winning the left side. This turned out to be a key move and the wind was better on the right. We crossed those that went right early and rounded the first windward mark third behind Matador and Bigimist. Down the first run we managed to wiggle our way round the turning mark just ahead of Bigamist who then slowed down the fleet a bit as they were not ready with their masthead Genoa. Matador, solidly in first, sailed a straight line to the next point of land while the rest of us were a bit leery of a possible hole right on the Cape, held high. Sure enough, Matador sailed into a hole and we took over the lead and never let it go. We have been working every night analyzing our performance and trying to improve. 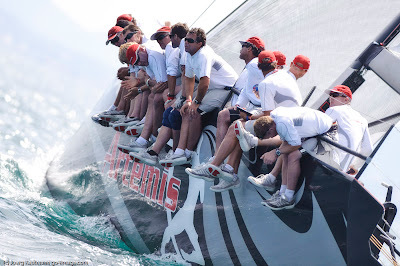 Matador is the fastest of the fleet here in these lighter breezes and she is virtually a sistership to Artemis. I think we made a little improvement in the power we are getting out of the rig and sails and this helped us today. Going to the performance meeting now so I will know for sure then. Five more races to go and tomorrow's forecast is quite light; 10 knots and under. These light races are very taxing as the wind is fluky and can't be read so easily. A lot of racing to go and many points can be quickly lost in this very competitive fleet.